While it's convenient to have a notebook case, bag, or backpack big enough to pack lots of your stuff in, a commodious bag can get heavy and tedious to lug around and into meeting rooms and offices. Sometimes what you really need is lightweight protection for the computer itself. After all, a good notebook is a self-contained computing platform (at least as long as the battery holds out). 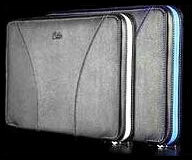 Semi-rigid slipcases provide more protection than a soft fabric sleeve case, but without the bulk and weight of a full-sized computer briefcase or backpack. The focus of this pair of reviews (the other looks at the RadTech Tekstyl Omni Case) is two variations on that theme, sharing some similarities, but definitely different interpretations of what the ideal for lightweight and compact notebook carrier should be. iSkin's SOHO laptop sleeve case is a lightweight, multilayered solution for carrying your 'Book to meetings, cafés, classes, or while commuting between home and office, offering more protection to absorb the hits and dings that could damage your laptop than a soft sleeve case would - but without the bulk and weight of a computer briefcase or backpack. Made for the MacBook and MacBook Pro, the SOHO also fits PC notebook's with similar dimensions. The SOHO laptop sleeve case is a pure, minimalist slipcase ideal for students, business users, or anyone who carries their laptop a lot, and it also also makes a great heat insulator when using your MacBook on your lap. 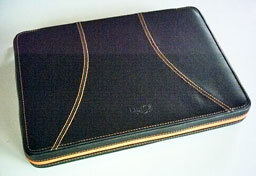 The SOHO may also be used for extra protection when carrying your 'Book inside a larger laptop bag or backpack. The iSkin SOHO's outer skin is of "premium synthetic leather" in black with contrasting color stitching and a matching color zipper-closure strip on three sides (wrapping around the case's back/bottom corners) for a very clean, stylish, and contemporary look. The outer skin material is soft, leather-textured, and lightly padded with a pleasant tactile feel, which is especially appreciated since the SOHO is meant to be carried in your hand or under your arm portfolio-style; there is no carry-handle or shoulder strap, nor is there provision for either. Inside you'll find more tactile sumptuousness. The SOHO's semi-rigid protective armoring is lined with soft padded plush fabric that looks great and is a pleasure to touch and gentle on your 'Book's finish. The fabric is dyed using only environmentally safe inks. The iSkin SOHO is available in your choice of five striking color combinations: azure (black with blue), graphite (black with grey), magnum (black with red), Sahara (black with orange), and Amazon (black with pink), respectively matching the closure zipper and external stitching. The review unit was a Sahara, and while I'm not usually a big fan of things orange, this particular shade is very attractive. "People need sturdy, functional protection for their computers, but don't want to carry around something that conflicts with their personal style," comments Tomas Rojcik of iSkin. "SOHO is sophisticated enough for the professional, yet stylish enough for the student - and it proves computer protection can be as great looking as it is practical." He's right. The SOHO is designed with attention to small but appreciated detail, like the positive grip zipper-pull with it's iSkin logo. 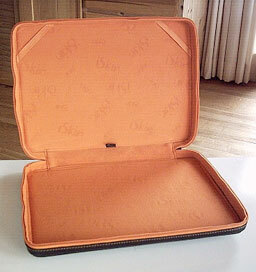 The SOHO is designed to allow you to use the computer without removing it from the case, which can be very convenient if you just want to grab a few minutes work on a train or bus, or in any waiting room, etc., but may need to pack up and be mobile again on short notice. The top panel of the SOHO is equipped with two diagonal elasticized retainers that slip up over the notebook's display lid to help hold the machine in securely place. 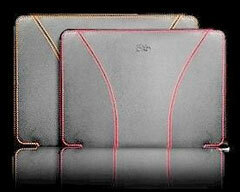 Using the SOHO in situ also provides insulation for your lap from the hot underside of the "laptop." While the SOHO model we tested is designed specifically to accommodate the Apple MacBook, I found that my 12" iBook also fit nicely, and I expect that a 12" PowerBook would as well. 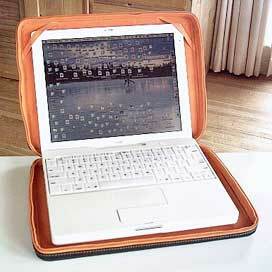 There is also a model sized to fit the 15" MacBook Pro and PowerBook. The SOHO case looks great and feels good too, with its practical downside being its minimalism and strict adherence to the portfolio metaphor. There is no room or provision for carrying incidentals, not even a small pocket. The SOHO case is well-made from what looks and feels like quality materials, and quite attractive, so pretty much the only thing to complain about is the price, which is a bit on the steep side for a simple sleeve case, however stylish and well-executed. The SOHO is aimed at the premium end of the market. So which of these slipcases is the best choice for you? As usual, it depends. I like the upscale look of the SOHO, and I love that bright, plush lining and the contrasting color stitching on the outside. it is arguably the one to go with if you will be carrying it in business or other environments where professional style is an important priority. Not that the Omni isn't stylish, but it has a more sporty, utilitarian flavor. On the other hand, I have to give the Omni the edge for practical functionality, with its clever "laptop stand" conversion feature, more secure attachment of the case to the computer, its multiple carry mode options, and the provision of at least that outside pocket for carrying a few incidentals. The Omni also has to get the nod for a higher degree of protection for the computer, thanks to its heavier armoring, and the fact that it sells for $13 to $15 less than the SOHO doesn't hurt either, although the prices are close enough that they won't likely be the deciding factor for most buyers. Ultimately, it boils down to which one suits your needs and tastes the best. They're both thoughtfully designed, attractive, and well-made products, and I'm rating them both 3.5 out of 4.